I still prefer to memorize my ‘main’ passwords rather than storing them in software tools (I do store some but not the ‘major’ ones). But there are powerful tools that you can use to securely store you online/offline user accounts, and if you have a lot of different accounts, then whether you like it or not, you will be forced to use one anyway. Now I’ve written about several utilities in the past, but because I loved its simplicity and ease of use, I thought bragging a bit about ‘Pasaffe’ wouldn’t hurt ;-). 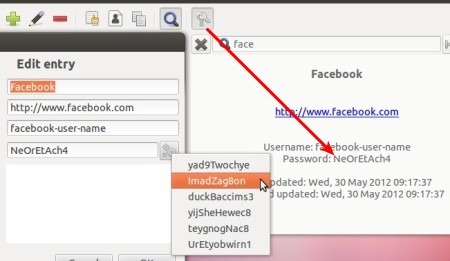 ‘Pasaffe’ is another relatively new password manager that you can use in Ubuntu. It uses an encryption algorithm called ‘Twofish’, and according to the experts, it’s as good as the extremely popular ‘AES’. So in terms of safety, it should be pretty secure. Like other tools, when opening it’ll ask for the master password (you can change it anytime) before you can view the individual entries. *. You can store both online & offline accounts, it even supports opening URLs too. However it cannot fill the details for you. *. You can add a title, URL, user name, password and notes to the individual entries. *. Has an in built password generator. *. Copy user-name, password or the URL fields. *. Save the database into the HDD (again, in a ‘container’ that’s encrypted using the ‘Twofish’ algorithm). *. Search and find entries easily. *. By default, it hides the password field for security purposes (of course) but you can use the ‘keys icon’ on the toolbar for show/hide the password field easily. *. Automatically locks the database if ‘idle’ for 5 minutes. And you can use its ‘Preference’ window for adjusting few settings (such as displaying passwords field by default, auto save changes to the disk, change the idle time for locking etc) as well. You can install ‘Pasaffe’ in Ubuntu 12.04 Precise Pangolin, 11.10 Oneiric Ocelot, 11.04 Natty Narwhal, 10.10 and 10.04 by using the below commands in your Terminal window (we’re using its PPA channel). That should do it. After that, if you’re using the ‘Unity’ desktop, search for ‘passafe’ in the ‘Dash’ and it should locate it for you. A thanks goes to ‘Marc Deslauriers’ for creating it :D. Good luck. Yes, a great tool. But how do I backup the passwords? Upgrading to Linux Mint 17.2, I lost the lot. You must be able to backup the DB.